One of my favourite ways to prepare for travel to a country, particularly one that is off the beaten track, is to read the country’s literature and newspapers. So before heading to Cuba earlier this year, I downloaded Everyone leaves (Todos se van), by contemporary Cuban author, Wendy Guerra. Do you have your own stories to share? It’s easy…. The book was set between 1978 and 1990 during the revolution, in a region in southern Cuba and in the bohemian quarter of Havana preferred by the intelligentsia of the time. It is about artist Nieve Guerra and, as the title suggests, about how the people she loves gradually leave her. Central to everyone’s leaving is the unrest and uncertainty of Cuban society during the revolution—which is the part that interested me the most. Putting aside any romantic notions of Che Gueverra and of revolution, I am fascinated by how people live during revolutionary times. The book gave me insight into the lives of Cuban intellectuals and artists who opposed the revolution and its curtailing of individual freedom. By the time we arrived in Havana I knew which streets I wanted to walk and which localities I wanted to stay in. When we reached our casa particulare, (a room in a private apartment or home rented to travellers and international workers) in a faded, blue-painted, concrete block of apartments in Vedado, Havana, I knew about such apartment blocks in this, the choice suburb of the intelligentsia. I knew to question the closed up and condemned apartments we passed on the stairs on our way up to where our host lived; from my reading I was sure these were once the homes of people who were extradited for their political views during the sixties and seventies. Our host confirmed my suspicions with a shake of her head and a finger to her tightly closed lips. I knew about the Bertolt Brecht theatre, which joy of joys was across the road from our casa. I knew about the famous Malecon, the stretch of water the city of Havana is built alongside, and the path on its edge leading from the suburbs into old Havana, for my heroine, Nieve, had walked the Malecon in winter, summer, day and night. I was determined to find the real Havana beneath the buzzing layer of hustlers, taxi drivers and self-proclaimed tour operators—although these too added a certain excitement to our adventure! Travel guides gave conflicting advice around accommodation, from ‘don’t stay in the casas’ to ‘don’t stay in the hotels’! So we spread our time in Havana between staying in a casa particulare with Adele, who had Spanish origins, and her family—her husband, daughter, son-in-law and grandson—and a hotel in Old Havana. We booked from Australia and the confirmation we received from Adele was a bit like Clancy of the Overflow’s thumbnail dipped in tar! Once in Cuba we were quick to realise however, that Adele’s access to email was a feat in itself as no-one had internet connection to the outside world, and even the big hotels had rationed and unreliable connections. Informal, non-official looking emails are the norm, not a sign of dodginess. The casa was terrific. Adele provided our meals and cleaned our room, and helped us with transport—her son-in-law owned one of those old American cars Cuba is legendary for—and suggestions of what to do. Cuba is not a wealthy country and the people have the bare essentials. They are on rations for some foods, they line up to do anything from going to the bank to buying ice-cream, and the government has only just given families permission to supplement income by renting out a room in their private home to travellers, so we were pleased to give Adele our business. But it was hard going because she spoke no English and we spoke a few words only of Spanish. Adele booked us a bus trip to a holiday town, which happened to have a festival running the weekend we were there. Cubans love their festivals and this one went all night. Between the cracking thunder of a storm and the vibrating thud of the music, nobody slept much! But we were in one of those quaint, brightly painted houses with a rocking chair on the front veranda, so we were happy. Adele had also booked us a horse ride to see traditional cigar making. Off we went, through the muddy back lanes of the town, over a creek swollen from storm the night before. The horses swam across the creek and we dare-devilled along a plank while holding tightly to a single support wire which had far too much slack and wavered with us as we tried to balance. We continued up and down gullies tortured with erosion, to a dark, old shed where our young strapper made us a Cuban drink and showed us how they used to make cigars. Not quite the sanitized tour wrapped up in occupational health and safety compliance one would get in Australia, but it was typically Cuban. As it rained for most of the ride we were wet through and my sandals clogged with mud but we knew the inner workings of a cigar! Perhaps the most defining moment of a trip is not one that is planned or found in a tour guide. Returning from our horse ride on the wet Sunday morning, we passed an ordinary looking apartment block, and it was the singing and chatter coming from within that struck me. We barely stopped, but I nudged my husband and said “listen”! Such apartment blocks in Australia are mute, but here in Cuba they sing! An unassuming moment but I’ll not forget it. Considering their poverty you would be surprised to know that Cubans are among the most highly literate populations in the world. I was intrigued by the accessibility of art, theatre, history and music. While we were in Old Havana it was International Book Day so we dawdled around the streets lined with makeshift bookshelves and bought ourselves a pirated copy of Graham Greene’s Our Man in Havana, a delightful send-up of British intelligence and espionage pre-Cuban Missile Crisis, set in the very bars and street blocks we were passing. We went to the Museo de la Revolucion (Museum of the Revolution), the most sacred building in Havana, where a young guide told us an absorbing story of Cuba’s history. The spectre of Che Guavera and the legacy of Batista can be seen throughout Havana, and of course we brought home the obligatory red scarf and Che T-shirt. Cubans are proud of their history and they can all talk about it. This museum was one of the highlights of our visit. 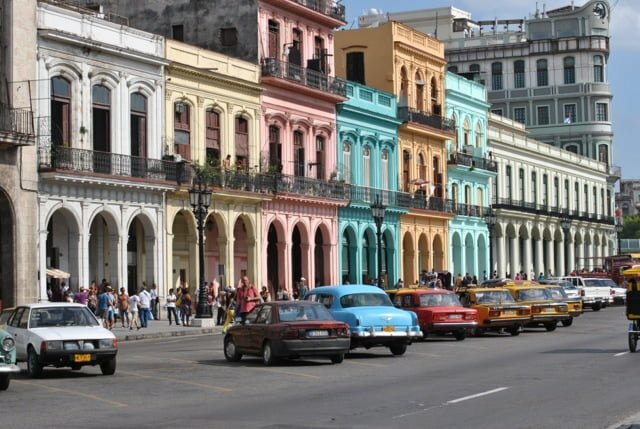 Old Havana was once a grand, old, Spanish colonial city. It has block after block of ornate buildings in all manner of disrepair and if the parts and materials needed for restoration or repair come from America, then an embargo means there is no immediate hope that the repairs will be done. The elevator in the Museo de la Revolucion, for example, had been broken for a year and as the parts come from America it will stay broken for some time yet. Scaffolding erected with hope around some of the old buildings is covered in vines. One day soon Cuba will open its doors and capitalism will move in. The Old Havana may be restored to its former glory, but I suspect this will come at a social and cultural cost. Did I find the real Havana of Todos se van? Not in the sense that we met like old friends over coffee, but yes, the real Havana was there, just in passing. Jacinta Agostinelli is a Melbourne-based writer and editor. She also works pro bono on the management committee of a local community organisation, cares for her granddaughter, and grows vegetables and raises chickens using organic and sustainable methods. She enjoys spending time with her family of five daughters and husband, especially in far away places.